Oooh la la!! These darling little dangling Eiffel Tower earrings are too cute! They would make a great gift for any little lady on your list. 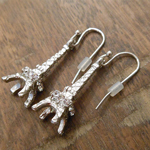 The silver Eiffel Towers have rhinestone detail and hang from silver wire hooks. They measure just about 1 1/2 inches long.